I think it’s a girl/female thing. The need to whip out a tub of ice cream and stick a big spoon in it and eat ice cream straight out of the tub. This is the typical after-the-breakup movie scene. There is a little selfish wantoness about it…after all I’ve stuck my spoon with all my saliva into the tub so no one gets to share, so there. I’ve always had a really soft spot for hazelnuts. When I used to work in a lab in Columbia U, there was a little hole in the wall cafe that was whimsically called the ER, a sly reference to the NY Presbyterian hospital next door. But apparently ER stood for Expresso Roast. I think it was pretty much the happiest place for me to visit because I could get my hazelnut coffee for $2 everyday to jumpstart my experiments. Somehow they had an unsweetened hazelnut-flavored brew; nowadays the hazelnut coffees I have been able to find get the flavour from a sweet hazelnut liquer, which is plain awful. Anyway I have always adored hazelnut flavours – hazelnut coffee, hazelnut gelato and pralines. A couple of years ago when I was in my ice cream-making fad phase, I did try making a hazelnut gelato that fell abysmally flat, probably because I didn’t roast the whole hazelnuts but was trying to work from the ground hazelnuts! Silly idea that was. I didn’t dare to reattempt making hazelnut gelato for many many years, but recently the craving got too strong. When I got an ice cream maker years ago, I think I pretty much mastered most of the recipes in David Leibovitz’s book “The Perfect Scoop”. Since going low carb however, I’ve had to make big adjustments in the recipes and I’ve managed to churn out decent chocolate gelato, coconut ice cream and even cheesecake ice cream. 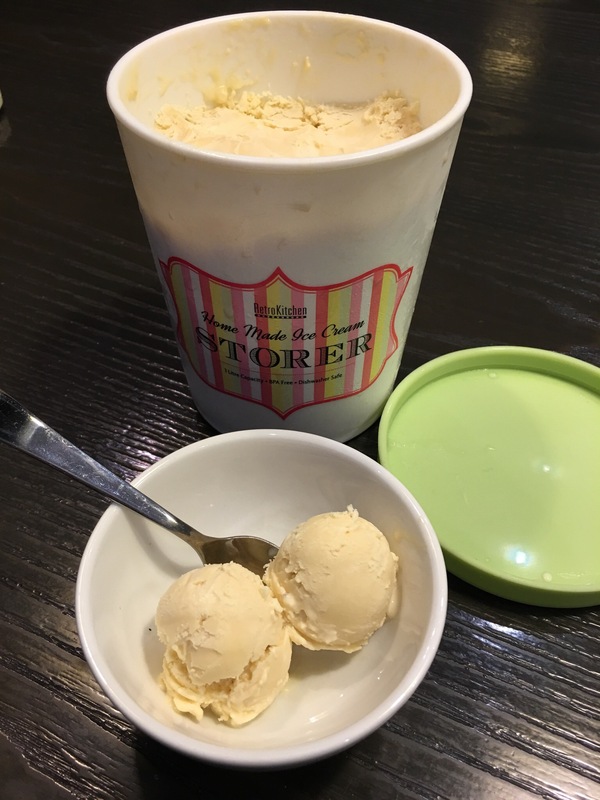 The biggest challenge of doing low carb ice cream is that the sweeteners tend to crystallize and harden the ice cream, which makes the later scooping out quite a nightmare. So I’ve learned 2 tricks along the way – add alcohol (woot!) or add vegetable glycerin. In a saucepan, bring 1 cup of heavy cream and 1 cup of whipping cream and the ground hazelnuts to a low boil. Take off the heat and cover the saucepan, allowing the mixture to steep for at least 2 hours. Drain the mixture into a sieve lined by muslin cloth. Squeeze out all the liquid. Discard the solids. In a clean saucepan, bring the hazelnut-steeped liquid as well as the remaining whipping cream up to 70 deg C (165 deg F). Stir gently to ensure even heating. While heating the cream, beat the egg yolks and sweetener together briskly and thoroughly. Gently add the heated cream to the egg mixture in a steady stream, continuing to whisk the egg mixture well. Place the cream and egg mixture over a Bain Marie and continue to cook, stirring well with a wooden spoon or spatula, bringing the temperature gradually up to 70 deg C. The custard should coat the back of the spoon. Remove from the heat and cool the custard. When cooled, add 1 tbsp glycerin. Churn the ice-cream according to your machine’s instructions. Freeze the ice cream until ready to eat.